I was an original backer when the concept was crowdfunding, and I’ve finally got my two months supply of Soylent. To put this review into context I’ve was on a 50-80% Soylent diet for the first two weeks, and geared down to 33% for the next two weeks.¹ I believe I’ve had enough time to formulate my thoughts and an overall review of the product. In short, was it worth my money? Yes! Now, as my readers know me as the rather wordy type, here is the long version. The taste is, as many have described, similar to cake batter, which, at first, is rather off-putting. That, however, needs a clarification: it’s off-putting because it is a new taste (unless you regularly eat cake batter), not because it is off-putting by nature. After a few days, it just becomes a bland shake. Apparently, they made it bland so your taste buds don’t become accustomed to, and therefore eventually sick of, a specific taste. After a few weeks of gulping it down, I can attest to this. I don’t look forward to having Soylent, but I am in no way reticent in consuming it. There are, however, ways of improving the taste for those who can’t stand cake batter. I’ve found that adding a banana or a scoop of flavoured protein shake to the blender are two options that I’ve tried that help; the banana gives a more consistent texture, while the protein shake—at least the flavor I added—made it more pleasant. In short, Soylent is not very tasty, but it is that way by design. Soylent will give you cravings…end of story. As human beings, we have evolved over millions of years to have a strong preference for food, chewing, taste, spices, aroma, and the satisfying feeling of satiety. It wasn’t until the two-week mark when the cravings were becoming under my rational control and I could say “no” with some regularity. However, I consider this a benefit in Soylent’s favour. Let’s face it, aside from sweets, we acclimatize to our food (especially the ones we make day-in-day-out). The foods we eat are rarely a new thing, and although certain foods can be, the majority of food one eats day-to-day is decidedly average for the simple reason they are common. After having been on Soylent for just a few days, all food took on magical properties. (The first pizza I had after a few days of smealing was divine mouth-watering goodness.) Those meals where I did eat conventional meals (from here on out: meals = normal food; Soylent meal = smeal) bought forth new flavors, aromas, and feelings that I have only had earlier with novel foods (my most recent experience was with Thai food…I was just gobsmacked by how good Thai food in Thailand is). As I said above, I am still in the process of giving in to some cravings prematurely (especially sweets), but all in all, Soylent makes food taste fantastic! Soylent seems designed for this purpose: eat healthy food during those times, i.e. breakfast, when you want extra time or just a quick, heathy way to start your day, and, during social occasions, regular ol’ delicious food that tastes all the better. While eventually the intensity of the foods diminish, in general, meals still taste better on a majority Soylent diet than not. That first week, however, is amazing. I wouldn’t be surprised to see a week-long 100% Soylent diet fad in the near-future for the sole purpose of having a few days of food-assisted ecstasy. I have one food day a week, generally Saturday, where I set Soylent aside and spend the day eating (the first Saturday was a blur of chocolate, ice cream, and crepes). Having this Soylent-free day also allows me to contrast both how food and Soylent make me feel, and, I’ve learned since, to appreciate the beneficial aspects of both. I don’t want to be solely in one camp or the other; rather, I want the best of both worlds. In this case: the ease and nutrition of Soylent; and the deliciousness and sociability of food. Soylent is very light on the stomach, and this affects my energy levels for the better. While consuming it, I’ve never had a post-lunch energy crash…ever. which is a routine occurrence with food, especially of the heavier type (I can only go so long without my wife’s sausage-infused risotto). On food-heavy days, generally, I’ll feel a stronger urge to take one of those afternoon naps, and just have lower energy overall. Today (as I write this paragraph it is 1pm) I’ve been up since 730am and finished breakfast by 740am (!! ), and… I’m just coasting. (Coasting is a really good thing when there is an 8-month old crawling around the house putting everything in his mouth). It’s hard to describe the positive aspect of ‘feeling light,’ because it is not really at all what it sounds like. It is simply the absence of feeling heavy, and that is harder to put into words; you just feel normal. (It’s like saying one is not feeling murderous; there is no way to describe that.) Having your stomach remain mostly empty between meals is confusing; horridly so in the first week. To sum up: Soylent makes you even, or, perhaps a better way to put it, stable. Soylent is great: it saves time (breakfast alone used to cost me 45 minutes), is healthy (as far as I can tell), and keeps one even throughout the day from an energy perspective. Perhaps the best aspect: it makes food taste divine, and I even find that the taste is growing on me. With that, I can only imagine that it will get better in the future with the Silicon Valley roots of the company. As I finish writing this up, Rosa Labs has just announced animal-free vegan-friendly Soylent v1.2. I look forward to what this company produces in the future. If you have any questions that I didn’t address, please feel free to leave a comment below. 1 - The reason I lowered my daily consumption of Soylent was simply to make it last longer. I have two months of Soylent, with no means to buy more for the foreseeable future as I've moved abroad. At 33% of my daily requirements, it'll last me 6 months instead of 3. Fourat – you and I really do live parallel trajectories. I too ordered Soylent… months ago and I still haven’t received it, and wonder if my order dropped off the planet somewhere. How long did you have to wait for your order? Glad you liked it! Hi Julee, it seems that we do! Well, as I was an original backer, shorter than most, but still long enough. They have massive lead-ins. It is hugely popular, so you may have to wait a little while longer: it is worth the wait tho! I am so excited! My Soylent FINALLY arrived. It took, like, a year or something, but it finally arrived. Having just unpacked the pouches, pitcher and measuring cup from the rather heavy box, I am impressed by the packaging, the quality of the measuring cup, but not so crazy about the plastic pitcher. 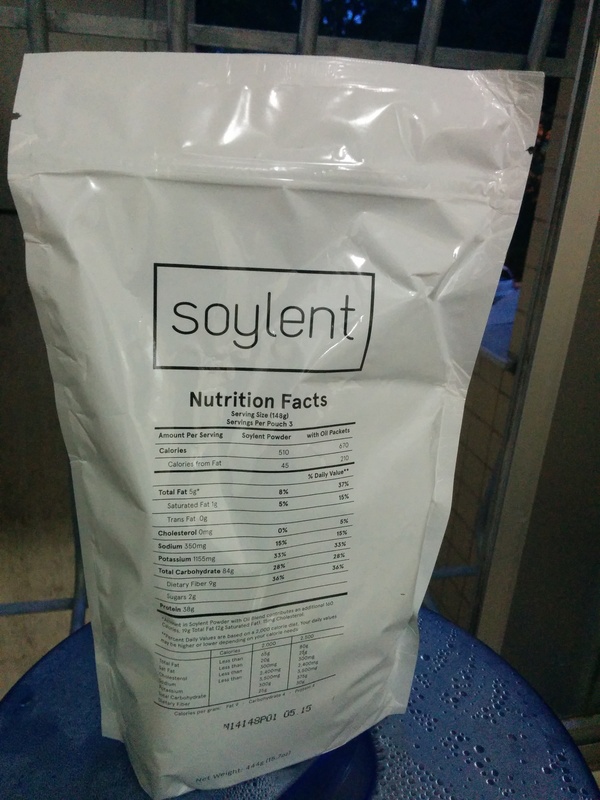 I will try my first Soylent meal and comment here. Really, I love that pitcher. I have 2 since they accidentally sent me an extra one. Looking forward to your thoughts. Just my 2c: I ordered a week’s supply the day after the CEO was on Colbert. That was mid-June and my order arrived yesterday. So 5+ months, but at least returning customers cut to the front of the line and I have to assume that number is trending down. Haha, sausage-infused risotto is the bomb! How are you liking it? I like this concept very much… Generally I view food purely as fuel, and therefore try to keep it healthy as possible. Flavor and enjoyment mostly not too important, so this would be a great addition. However, at times there is nothing better than sitting with friends over a great meal and truly enjoying the conversation and flavor of the food. So Soylent would complement my eating habits very well; a healthier way to live in some ways. Nice post. Though I like a good meal, Soylent is a fascinating concept and it might change our ideas about food. Soylent has definite potential IMO, though for many people perhaps only as part of a broader diet. Of course, it has practical value and that’s one of the reason I find it interesting. They use rice protein, the only animal products in v1.0 and v1.1 were the fish oil. Now with v1.2, they have used omega oils from algae, so it is completely animal free. So when we gonna grab a beer? I’ll be in Sao Paolo again from the 25-27th… Come on down to play ‘the price is right’! You know I loath SP, although I would like to see the Dali exhibition. Will let you know if my defensive repulsion of that city is waning toward the end of the month. What are you up to, anyway? Between having all my documents on the cloud, landing probes on comets and a compacts powdered meal, the future is shaping up to be exactly what I thought it was going to be. Now we’re just waiting for the uniformity of fashion! So, Mr. NwO, what, if I may ask, is next?